Cut And Sew Team Kit, For A Team Strip That Stands Out. Cut and Sew to create a team strip that stands out from the rest in the crowd! Using our Cut And Sew service here at printed swim caps we can provide you with team kit that is totally unique to you! We can design a tracksuit to suit your needs and complement it with Performance T-shirts, Hoodies and Accessories. 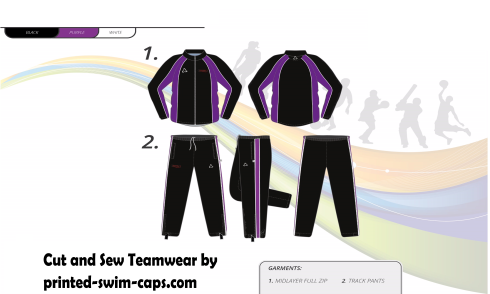 The cut and sew kit can have panels added in the tracksuit tops or bottoms, ribbon can be blended to add a bit of class, they can also be embroidered for that perfect chest logo. Below are some examples of the cut and sew design boards, the design board is to give you an idea of what the garment is going to look like and gives you the chance to make any changes, if needed.